Transnational Bachelor Degree in Hospitality Managment - what that means. When an earthquake hit Nepal in late April, it affected many Nepalese students from Wittenborg University who feared for the lives of their families back home. 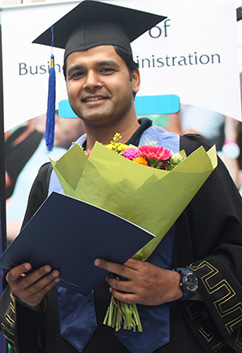 One of those students is Santosh Karki who graduated with a Bachelor degree in International Business Administration (IBA) last Friday during Wittenborg’s Summer Graduation Ceremony. Karki’s tutor, Dr Saskia Harkema, praised him for his dedication to his studies. “He knocked our socks off with the presentation of his dissertation,” Harkema told the audience on Friday. Karki said in an interview he plans to do a Master of Science degree at Wittenborg next year. Hi, Santosh. Which IBA specialization did you follow at Wittenborg? Why did you decide to study in the Netherlands? I came to know the Netherlands is the first European country that are offering courses in an English medium. Why did you choose Wittenborg University? I got detailed information about the university from the Student Registrar, Santosh Aryal, and I was impressed. How did your expectations of Wittenborg live up to the reality? It came true as I expected before coming to study at Wittenborg. What are your career plans post-graduation? I will do my Masters at Wittenborg. Why do you prefer continuing your studies in the Netherlands? I am planning to stay in Netherlands because I found it to be multicultural and diversified. I am also emotionally attached to the place. In which city did you stay while studying and what were your impressions of that city? Apeldoorn and Amsterdam. Both cities are very good. What were some of the challenges you faced as a student while studying? I was treated as a local student, not as an international student. So the hospitality of the university was very impressive. Would you recommend the Netherlands as a study destination? Which was your favorite module and which did you struggle with? My favourite module was quality management. I struggled with the dissertation because it was new to me. At Deep International Textiles in Amsterdam. Which people at Wittenborg were an inspiration to you and why? Santosh Aryal, the Student Registrar. He was very helpful in so many ways. What advice would you give current students about studying in the Netherlands and for achieving your study goals? Please stick with your dream and determination.